Who wants to make some more Amazon sales? If you shouted YESSS, then all you need to do is step out of your cave and start to H-U-S-T-L-E. Yes, leave your unfinished mammoth painting, the charcoal on the ground, and your lovely spouse and go out in the world, hunting for Amazon sales. It’s not that hard even if you’re a complete newbie. 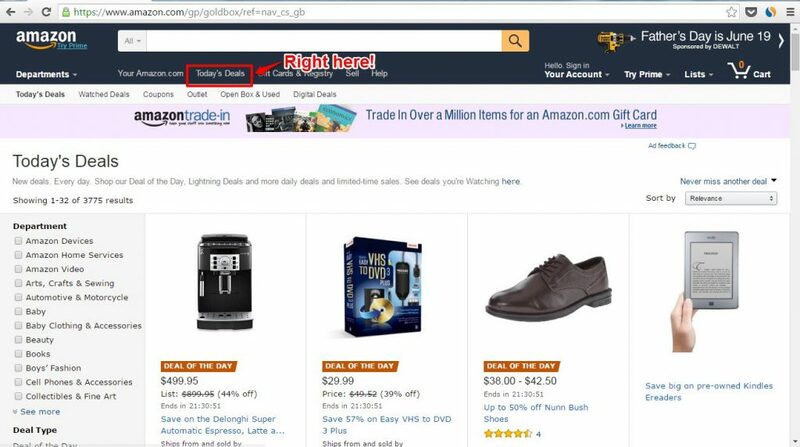 Try these top 7 Amazon hacks to up your game, boost your rank and start getting more sales. You know how Amazon works… Someone types in a search term and they get a list of products that Amazon thinks are the best match. You want to be as high in the search results as possible for any relevant term. This means you should always look to do proper SEO on your listings. That’s great except that… Amazon is NOT like Google. You don’t have a built-in keyword tool. You don’t have official estimates of search term volume. BUT there is at least one free solution and many paid solution to this problem. Do your own manual keyword research on Amazon. 3) Do that for the entire alphabet. You can see how that will quickly explode into hours upon hours of hard labor. I’m too lazy for this method. If you prefer to automate things here, you can try the KTD Amazon Keyword Tool. It’s 100% free. It does what I just described: It queries the Amazon search box for all long-tail search suggestions for your keyword + each letter of the alphabet. It also shows you the keyword rank. If you’re looking for a more fancy alternative (that saves you a bunch of time! ), try Keyword Inspector. This is one of the best keyword research tools on the market with a database of over 50 million buyer keywords. It can give you pretty accurate data about what people are searching for on Amazon. 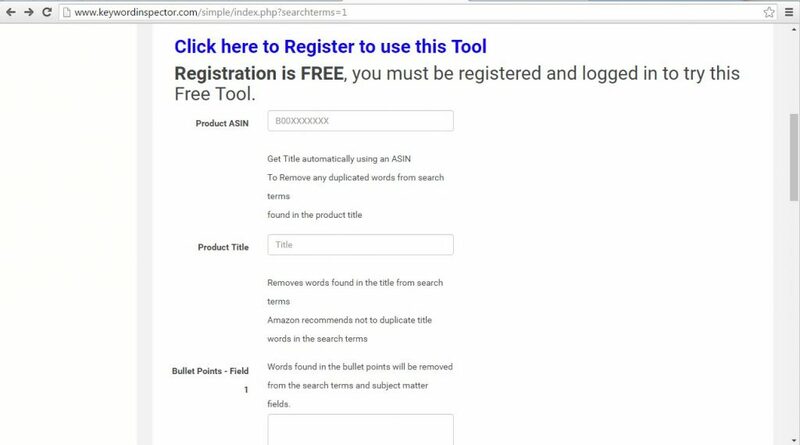 In fact, you can give Keyword Inspector a go right now (absolutely FREE). It will do a free scan on your listings and give you ideas about how to optimize them. NB! 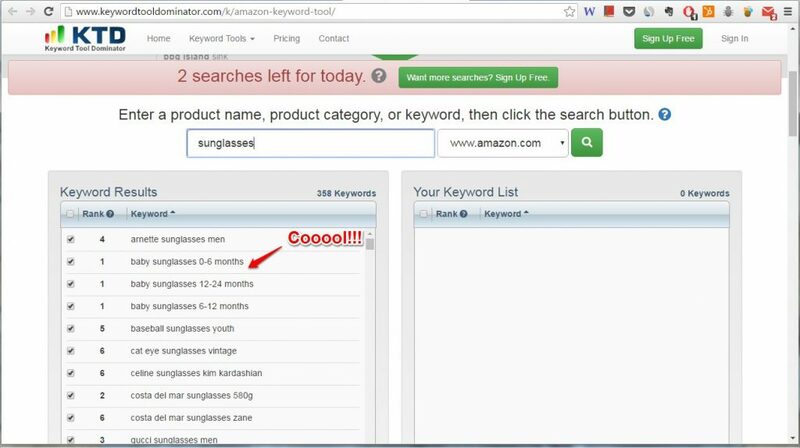 If you decide to invest in one of these Amazon keyword tools, keep in mind that they don’t get their data from Amazon. These types of tools usually pull data from major search engines, then identify matching queries in Amazon, and then use an algorithm to combine that data and give you estimated traffic numbers. You can find more info about other paid keyword research tools here. Want to absolutely kill it? To be in the top 3? To swim in golden coins Uncle Scrooge style? Boost the sales for ONE of your products. Optimize the heck out of your listing to get it closer to the front page and then… Then get a ton of positive product reviews. NB! I’m NOT talking about seller feedback. I’m talking about product reviews. These appear on your product listing and are the rating of a particular product, not your overall rating. Product reviews are one of Amazon’s ranking factors. But, also, they are REALLY important to those people behind screens who are lazily browsing Amazon and looking to spend some cash, a.k.a. your potential customers. To be precise, 88% of consumers in a survey said they trust online reviews as much as personal recommendations. You can see where this is going, right…? The big fish are taking advantage of it. If you want to dominate the Amazon marketplace (And, of course you do! 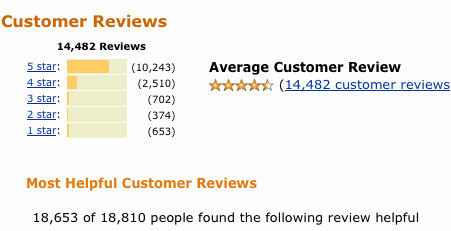 ), you need to have about 50 more reviews than the top competitor. Yes, and that’s why you can use a tool such as the AMZONE Reviews Club. It’s absolutely free and 100% white hat. You offer a discount and people commit to leaving you a positive review if they take advantage. Check this post for more info about Amazon seller feedback and reviews tools. I don’t recommend any sort of fraud, deception, gimmick or hoax BUT… We’re hustling, people! You have competition who made it by studying and piggybacking on THEIR competition. ASIN piggybacking might sound unethical to some but it’s nothing dishonest. It means you did your due diligence and you found an opportunity to compete on price. Find a successful product and look at its ASIN. It will be listed in the Product Details section of the product listing. Hint: Look at Buy Box products. They are the cheapest, often best selling and the seller is required to enter an ASIN to be eligible for the Buy Box. Research the manufacturer and figure out how it will cost to buy the same product wholesale. Calculate your shipping costs. Can you offer a lower price than the current Buy Box product? If you CAN offer a lower price… Do you need me to tell you what to do?! Contact the manufacturer and start makin’ moneyz. If CAN’T offer a lower price, don’t despair! Contact the manufacturer and try to negotiate a special deal. They may say no but they may also say yes. You’ll never get the deal if you don’t ask for it. None of these worked? Don’t back down. Look around for other products in the same niche, even if they have lower ranks. You’ll find your gold nugget if you’re patient enough and… well, a bit stubborn. Do this at your own risk. The black hat method for ASIN piggybacking means that you find knockoffs of popular products and list them with the same ASIN as their genuine counterparts. Poor Amazon… It has a pretty bad process to identify this type of ASIN piggybacking. To confirm you’re a fraud, the seller you’re piggybacking onto has to order one of your products and offer proof to Amazon that it is indeed a counterfeit product. You should know that Amazon doesn’t exactly try to hunt down cheap knockoffs who are using ASIN piggybacking. BUT, if they have proof you’ve done it, your account will be suspended or even terminated. There is also the other side of the matter: What if somebody did this to you? To make sure that your ASIN piggybacking is completely white hat, make sure that you’re buying and shipping the EXACT same product—same brand, same SKU, etc. Triple check, if you have to. Amazon puts enormous stress on fast, hassle-free shipping for their customers. That’s why they encourage sellers to use their Fulfilled By Amazon program. How can you increase your shipping performance and get a higher rank? Amazon has a number of metrics they use to try and figure out if your customers are happy with your shipping procedures. Let’s look at them. Making customers happy is easy as pie—ship their orders super fast. Make sure you take care of this metric from your first day as an Amazon seller because you’re getting a record of how soon your past orders were shipped. If you’re consistent and efficient in your entire order processing, your customers will be happy, there will be no complaints and you’ll get a higher rank. Just picture this… You are desperately sifting Amazon listings trying to find the perfect set of headphones. You finally find them! They are the perfect combination of price and quality. You place an order and start waiting for your precious new headphones to arrive. But then you get an email. 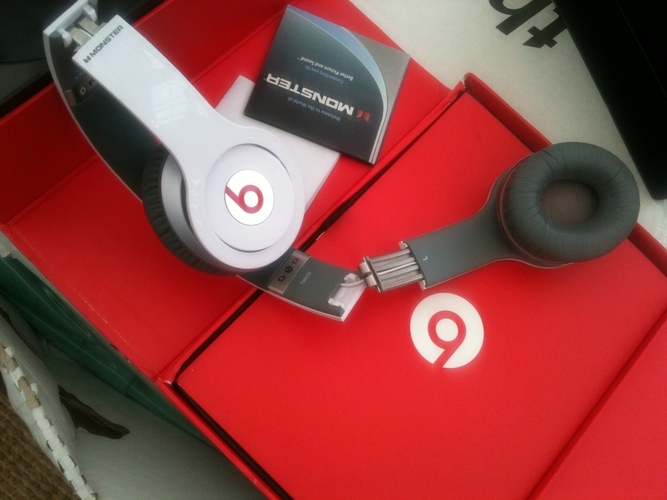 Тhey don’t have the headphones in stock… You feel cheated! That’s BAD customer experience right there. You don’t want to do that because people will stop trusting you, they will stop buying from you and, of course, Amazon keeps track of these cases and lowers your rank. To keep your sales flowing in and your rankings high, make sure you monitor your inventory and you have your best-selling products in stock. How does Amazon find out that you’re selling products that are out of stock? It tracks Percentage of Orders Refunded and Pre-Fulfillment Cancellation. Amazon has found that, when a seller has higher refunds and cancellations, it’s usually a clear signal that the seller has very low in-stock rates and fails to supply the products. Besides keeping track of how many customers drop off at the different stages of the buying process, Amazon has a way to find out how many customers went through this process smoothly. It tracks how each order went from the moment they clicked “Add to Cart” to the product arriving at their door. Usually, having a high Perfect Order Percentage means you have a high in-stock rate, that your product listings are accurate and you’re shipping everything fast. That’s what Amazon wants you to do because it wants you to have happy customers. Your customers are their customers, too. They are the people who will come back to the Amazon website and buy more which means Amazon will make more money. It’s obvious that a high POP means a higher rank for you. And then, there are these cases when you order your headphones, they arrive at your door, you open the package and… they’re broken! Now, THAT’s even more frustrating! I get it. It happens. But keep in mind that Amazon is right behind your back, sniffing around for complaints about defective orders. Every time a customer makes a claim that’s considered an order defect. Your Order Defect Rate goes up and your rank goes down. Ouch! Each of these cases will increase your Order Defect Rate. This number is calculated by comparing number of order defects to the total number of orders fulfilled over a given period of time. Pro Tip: Amazon recommends to aim for an ODR under 1%. NB! If a customer removes their negative feedback, it does not count towards your ODR. So, contact personally each and every one of your unhappy customers. Amazon is constantly trying to encourage sellers to switch to FBA. And what better way is there to make sure your shipping performance is stellar? You’ll be allowed into the competition for Amazon Prime listings. Now, that is, by itself, a HUGE reason to join. Let’s face it, people: FBA products will always rank higher than merchant fulfilled products. So, if you want to quickly move to page 1, hop onto the FBA bandwagon! In some niches, it’s a de-facto standard and you can’t even get to page 3 if your orders are not FBA fulfilled. There is no official statement from Amazon saying that they are indexing your seller name and using it for searches. But they won’t reveal their search algorithm anyway. So, smart folks poke around Amazon’s search and use trial and error to figure out how it shows search results. I switched to page 390 (of 400) and found some brand that was ranking at that page. Added the brand name to the search term. Guess what! Repeat that as many times as you like. It works. 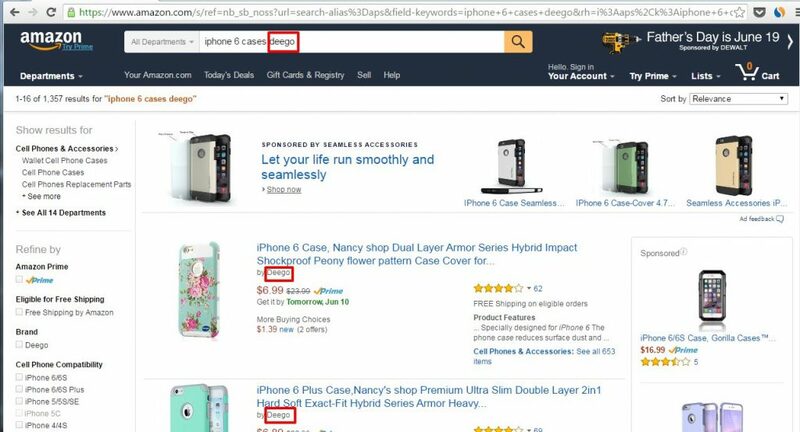 So, I’m not trying to say here that you should change your seller name BUT if you’re new to this and you’re about to start an Amazon business, think about a search-friendly name (and, eh, do your keyword research). What do customers love the most? Amazon has built-in tools that allow you to create and promote deals with little effort. If you’re an individual seller with a Pro Merchant Account, a Professional Seller or a Vendor, you have access to these amazing promotional tools. And, you should know that regular Amazon shoppers take advantage of these daily deals. So, you WILL get a ton of exposure. Wow… That’s a whole load of promotions to choose from! NB! Promotions have their own unique links and listing pages. So, if your seller status allows that, you can create your own VPCs just about any product you sell, get more exposure and make more sales! List your VPCs on third-party deals sites. What better way to get tons of traffic with little effort… These websites are looking for sellers like you. They NEED deals to attract traffic to their own website and keep people coming back. Just search Google for “submit a deal”. You’ll get plenty of websites that can become your partners. Submit your VPCs to at least 10 of deal websites each day (not all of them will respond, of course). Soon, you should start getting some solid traffic. Offer bigger discounts than the competition. Amazon is all about giving its customers the best deal on the market. So, competing on price is usually a winning option. Research your competition and the discounts they are giving and try to offer a mouth-watering deal. Give VPCs to friends and family in exchange for reviews. Calculate a VPC discount that will allow you to just break even. The point is not make profit but to get lots of positive feedback that can skyrocket your VPC listing. 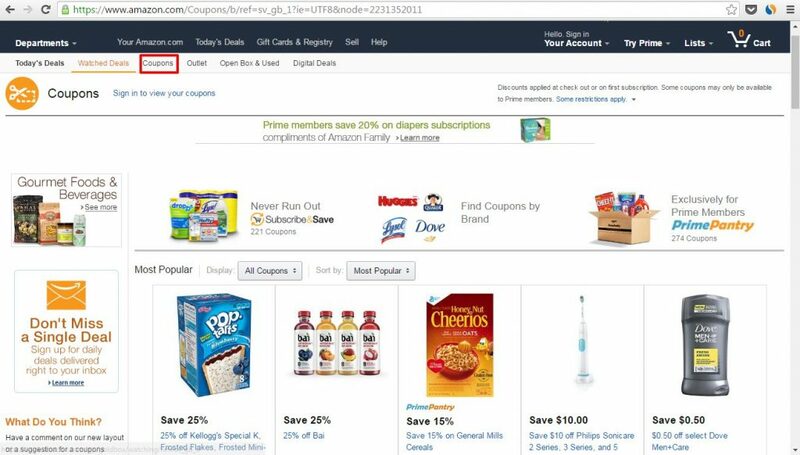 Give out the coupon to friends and family and ask them to simply purchase the product through Amazon. They will be happy because they will be getting an awesome deal and you will get a Verified Purchase review. Everyone is happy! NB! To get on deals websites you really need a deep discount. They’ll probably ignore you if you’re trying to do penny-pinching because they’re looking for impressive deals to offer. Even if you don’t have the privilege to create VPCs, there is still hope for you. Look into discount-in-exchange-for-review tools like AMZONE Reviews Club. We’re all in the deadly fight to win it and keep it to ourselves. Well, it is possible to be in the Buy Box from time to time but, no, you can’t stay there forever. Sorry. NB! If your seller rating is below 90%, work on that. Buy Box products are always from sellers with a rating higher than 90%. But, if you have the magic rating percentage and you’re doing your best to ship on time and get good reviews, you’re ready to compete for the Buy Box. You only need to keep track of what others are pricing in your niche and offer the lowest price. How can you stay on top of what everyone else is pricing? Invest in a repricing tool. There a number of these on the market. 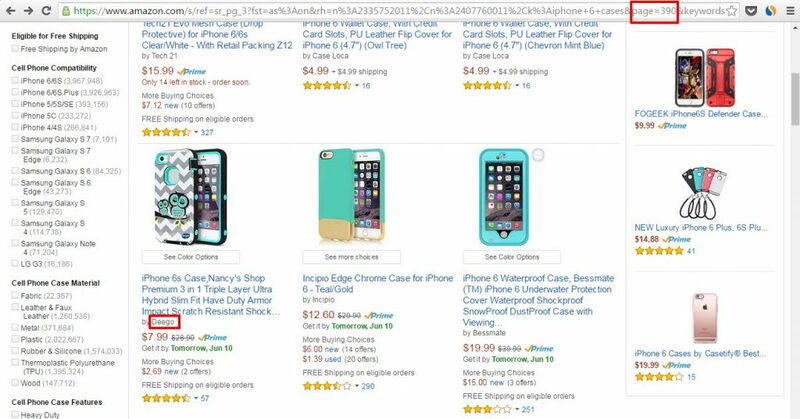 I covered most Amazon repricing tools in this post. Using a repricing tool is almost a requirement when you have lots of products for sale. You just can’t stay sane and keep track of how each one of them is priced. NB! These automated repricing tools have robust algorithms to ensure that you won’t selling your products at a loss but it’s always a good idea to keep a close eye on all your product prices. Repricing errors happen from time to time and that can be a nasty pill to swallow. Woo-hoo! You read this far… Or maybe you scrolled for the TL;DR. No problem, I’m not mad. But you should still read the whole thing because it will help you rank higher and get more sales. Before you do anything else, do your keyword research and optimization. There are both free and paid tools for this. Get a ton of positive reviews to boost your ranking and move closer to page 1. Do this for at least one product. Discover opportunities to make money by piggybacking on the ASINs of successful products. Shipping and fulfillment is a top ranking factor on Amazon. Make sure you’re doing a stellar job and consider using FBA if you aren’t already. Leverage Vendor Powered Coupons to attract more buyers and promote a specific product (especially in crowded niches). After you’ve done all of the above, invest in a repricing tool and start competing for the Buy Box! Becoming a Successful Aussie Online Entrepreneur is absolutely within your reach, I promise. Even if you’re new to all this. You have plenty of tools and hacks to make the most of it. All you need to do is get your hands dirty! Got any more hacks? Share them in the comments!